AI interaction technology for all business areas at Global Robot Expo 2019! 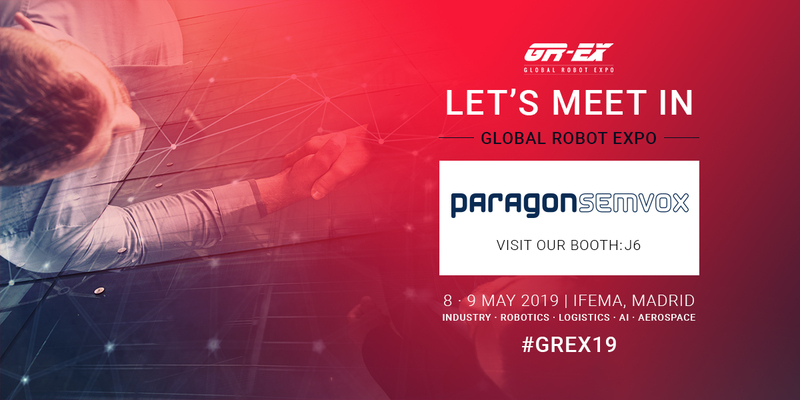 Global Robot Expo (GR-EX) is an annual B2B international trade show in the world of innovation, robotics and industry celebrated at IFEMA in Madrid, Spain. It’s a meeting point for more than 28,000 visitors from the sectors Robotics, Industry, Logistics, Artificial Intelligence and Aerospace. For the first time ever, in 2019, different areas of the event will be differentiated to highlight the importance of business sectors, with a special focus on GR-EX Industry and GR-EX Logistics. We will be there for the third time in a row. In recent years, groundbreaking technology changes have been made and new ideas have been developed. Now we can proudly present the latest AI interaction technology for businesses: see our various demos and convince yourself from the most sophisticated platform for AI assistance worldwide! We are not alone – our partner Nuance will support our stand with information on automatic speech recognition with VoCon and text to speech transformations with Vocalizer Embedded. Watch out for our disguised exhibition team and learn more! Meet us from 8th to 9th May 2019 at IFEMA in Madrid, booth J6. For your free ticket, please contact marketing@semvox.de.